Percy Jackson meets Indiana Jones in the New York Times bestselling epic adventure Seven Wonders! The Curse of the King is the fourth book in a five-book series by master storyteller Peter Lerangis. This sequel to The Tomb of Shadows, Lost in Babylon, and The Colossus Rises chronicles the adventures of Jack McKinley and his friends as they face their greatest challenge yet—the long-lost Statue of Zeus. In their struggle to undo what's been done and unlock the secrets of this Wonder of the Ancient World, our heroes must confront gods, relive old battles, and face down their own destiny to save themselves—and the world—from destruction. 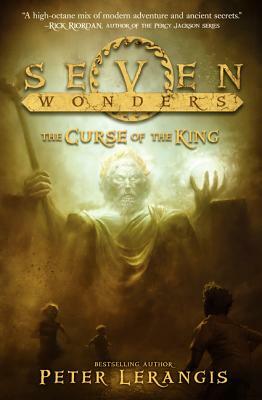 Rick Riordan, author of the Percy Jackson series, praised Seven Wonders Book 1: The Colossus Rises as "a high-octane mix of modern adventure and ancient secrets. Young readers will love this story. I can't wait to see what's next in the Seven Wonders series!" Peter Lerangis is the author of more than one hundred and sixty books, which have sold more than five and half million copies and been translated into thirty-three different languages. These include the five books in the New York Times bestselling Seven Wonders series, The Colossus Rises, Lost in Babylon, The Tomb of Shadows, The Curse of the King, and The Legend of the Rift, and two books in the 39 Clues series. He lives in New York City with his family.